Success Creations is a mask company proudly operating in Lakewood, NJ for over 25 years. They are one of the only companies in the entire USA that specializes only in designing some of the most gorgeous handmade masquerade masks ever created. Masquerade masks are all they do, and you will surely see that difference in the quality of their designs. These are so neat! I have seen some people decorate their homes with these masks and they are so intricate to look at. Emilee from Deals of Sweetness loves that Success Creations puts so much care in their designs and are handcrafted in the USA. See what she thought in her masquerade masks review. Is there a mask (or masks) you love? 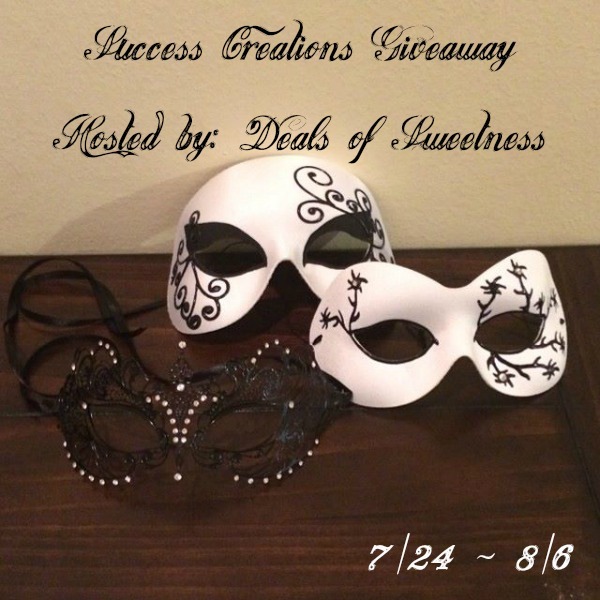 One winner will receive a $50 Gift Card to Success Creations! This giveaway begins on 7/24 and ends on 8/6 at 10:00pm (times are Central) and is open to US residents ages 18+. Please refer to the full terms and conditions in the Giveaway Tools. Next post: Blogger Opp! Keep Your Cool For Back To School’ Giveaway Event! I love the Chantel mask. Love that it’s made of metal and the intricate design is gorgeous.